Hi, I'm Jackson, I am 7 years old, and I'm a newsie! In the picture I don't really look happy, I'm not. I don't really like being a newsie but it's the only way to help me and my family get some extra money to pay for things to keep our family healthy. Like getting some new clothes, my clothes are very dirty and I'm scared they're gonna make me get sick. My father works at a factory, my older brother is a newsie too and my mother stays at home and does the house work. Being a newsie is a lot of work. All around me are other little kids like me that don't have to do this. They get to play with each other instead of trying to get money for their family. It's not fair! I am the littlest kid in the group. It's easy for me to get money because I just pretend I'm sick or something and people pay me extra money! 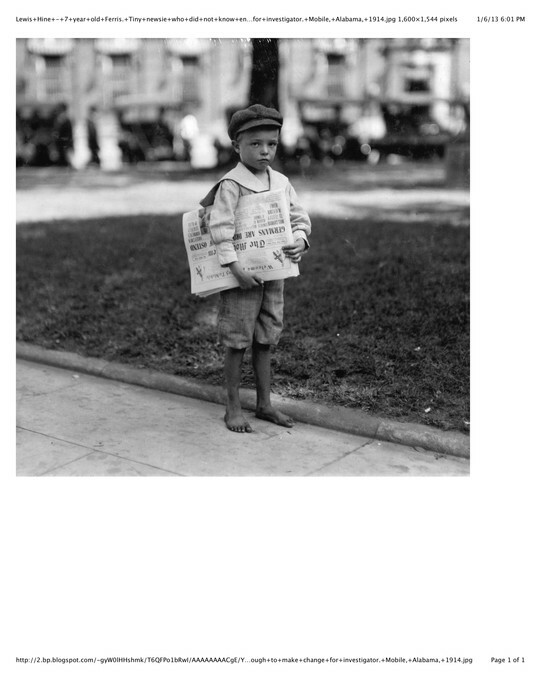 It's very hard being a newsie because I sell papers all day and I never get a break to go play! When its super time, we all stop and go in for the night. In the morning we do it all over again! I hate it! I wish I could just be a normally kid who gets to play all day!